Don’t let their appearance fool you. The self-titled debut album from the NowhereNauts showcases Hunter Lombard and siblings Anders and Sofie Kapur as seasoned musicians possessing musical maturity well beyond their years. Under the tutelage of Kevin March, the former drummer of Guided by Voices, this NYC-based trio is about to make a great first impression on the world. The energy and zeal exuded by the NowhereNauts is refreshingly unpretentious. Sofie’s unique vocal style is both powerful and sweet which is an interesting duality. Coupled with Hunter’s robust guitar riffs and Anders’ brooding bass lines, the band collectively manages to maintain a fresh and youthful sound. The melodies are unrelentingly infectious, in a good way, and the lyrics are playful and catchy. “Over and Over” and “Rather Be Haunted” will have your inner-teen jumping around in your bedroom until your mother tells you to turn the music down. However, the album is simply not a one-trick-pony. 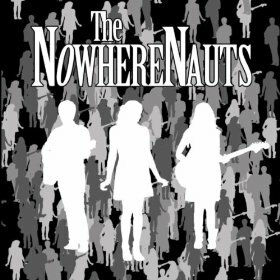 The range of songs, from the swooning “Where is my Mind” to the dreamy “Heat Stroke,” shows an eclectic sensibility blending a variety of musical influences into one neat little package that is The NowhereNauts.